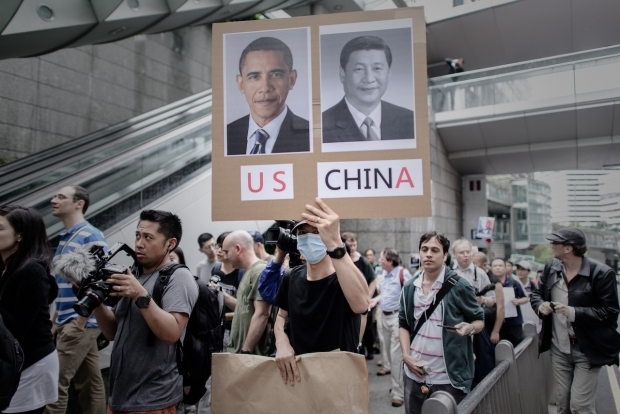 Protesters march to the U.S. consulate in support of Edward Snowden in Hong Kong on June 15, 2013. The reason why both Americans and Chinese have become so nostalgic for the great Nixon/Kissinger-Mao Zedong/Zhou Enlai breakthrough in 1972 is because that was the last time that Sino-U.S. relations experienced a dramatic breakthrough. Now, most policy wonks on both sides sense we need another jolt to kick the way we interact into a higher gear, but nobody quite knows how to accomplish that. When he met Obama recently at Sunnylands, Chinese President Xi Jinping lofted the idea of a “new great power relationship.” But then, the cyber security issue that the Obama administration had already put on the front burner—especially the cyber theft of private corporate intellectual property—got written even larger by l’affaire Snowden. This gave Chinese nationalists a nice opportunity to mount a high horse and even the score up a bit, as Ministry of Defense spokesman, Yang Yujun, did when he defiantly proclaimed, “The Prism-gate affair is itself like a prism that reveals the true face and hypocritical conduct regarding Internet security of the country concerned” which by “making baseless accusations against other countries shows double standards and will be no help for peace and security in cyberspace.” To many, the incident came as a real setback to any hopes for a major new diplomatic breakthrough. And yet, there could be a bright side to this story. With the world’s only superpower—to which China has long looked with a complex mix of admiration and envy mixed with resentment and animosity—now unexpectedly forced to eat a super-sized portion of humble pie, and the Chinese enjoying a rare moment of schadenfreude, the playing field may have suddenly leveled a bit. That’s important because, even though there is a real difference between the motives for and the kinds of surveillance that each country engages in, if there has been one thing that has galled Chinese in their relations with the West and Japan, it is the enduring presumption of their inequality, an imbalance that has deep roots growing out of their history of decline while being imperialized and exploited by foreigners. It has been Beijing’s insistence on this notion that the Great Powers somehow still look down on them that has continued to make Beijing’s relations with Washington so often fraught. But suddenly here was America also knee-deep in mud, thus creating a moment of cryptic equivalence that felt irresistibly sweet to many Chinese. As Romans 3:23 reminds us Americans, “all have sinned and come short of the glory of God.” A patriotic Chinese doesn’t have to be a churchgoer to enjoy such a moment. The foreign predation, exploitation, and occupation during the nineteenth and twentieth centuries which characterized China’s fall from grace allowed the Chinese Communist Party to spin an elaborate and convincing ideological narrative of national victimization. For an empire once able to assume superiority without a second thought, to have declined so precipitously and ignominiously that by the early 1900s it had come to be known as “the sick man of Asia” represented an agonizing fall. From the first Opium War (1838-42) and the endless string of “unequal treaties” subsequently forced on it by the Great Powers, what most rankled China’s political elite—Nationalist and Communist alike—was the deficit of respect and equality afforded them. A popular expression of the pre-1949 period was, “be backward and get beaten,” (louhou aidai, 落後挨打), suggesting how Chinese then saw their hapless plight. Indeed, all of Mao’s chest pounding and brutality, as well as Deng’s later down-to-earth pragmatism, can be seen as an urgent, although sometimes misguided, effort to “rejuvenate” (fuxing, 复兴) their country, to somehow claw their way back from poverty and backwardness to what they longingly referred to as “wealth and power” (fuqiang, 富強) so that the Great Powers could no longer bully them. Throughout the last decades, China’s bravado has all-too-often belied its intense yearning to have the “great powers” treat it as an equal. But even as American leaders now insist that they, too, want a new and more equal relationship, the U.S.’s default mode of interaction has all too often impressed Chinese as still being frozen in the old mold of a Western “great power” possessed of a self-proclaimed superior democratic system and a more enlightened set of modern values, looking down on and pressuring a benighted Asian land still steeped in outdated authoritarian practices. To Americans, such an approach may have an undeniable moral logic, but that does not mean face-conscious Chinese have not chafed under it. And, of course, as China has become stronger, its leaders have become ever less willing to countenance such old-style foreign lecturing and pressure. Thus, when it comes time to jointly deal with urgent issues like climate change, currency manipulation, Asian maritime disputes, the Syrian conflict, or the Iranian and North Korean nuclear issue, they approach negotiations with a chip on their shoulder. Now, however, as we head into the Strategic and Economic Dialogue, the fact that for the moment China does not finds itself cast as sole hacker-in-chief and Internet villain creates a symbolic moment when we may perhaps find the us-and-them atmosphere somewhat changed. But, a word of caution is due here: changing China from the outside has always been like bending metal. We may not admire their Leninist system of government, but what seems increasingly clear is that, while it will not do to abandon our principles, in China foreign pressure all-too often produces little but blowback. By suggesting how putting ourselves on a more equal footing may serve as a solvent, the Snowden affair may also help us see that projections of America as the all-knowing, all-righteous, all-mighty, and all-too ready to hector father-figure-to-the-world—a depiction that old-style Party propaganda in China tirelessly exploits—is not destined for success, especially for a country to whom equality and face are so important. Of course, there will be no magic if America alone makes new vows to seek a more equal and collaborative relationship if China, too, does not also shed some historical baggage. And a good place to begin would be to start retiring the old narrative of China as a victim. It is time for the Party to acknowledge that China is no longer a “semi-colonial, semi-feudal” country living in the early twentieth century, and that Western imperialism is not what it used to be and the Great Powers are no longer so “great.” In short, it’s time to retire the hoary Marxist-Leninist-Maoist narrative of foreign oppression, exploitation, and persecution of an inferior confected by the Party over the century. Only then will Chinese be able to put the humiliation of their unequal past behind them, transcend their deep sense of grievance, and finally reformat the suspicious mindset that has characterized so much of their approach to the U.S. to become true equals. If, for example, the U.S. and China could now actually begin to work toward some new protocols on cyber-surveillance and theft, it would be a real breakthrough. That may strike some as idle dreaming. But then, it is President Xi who has recently taken to speaking of dreams, trying to kindle his own people’s interest in a so-called “Chinese dream.” So, why not also a joint dream of a more equalized and mature U.S.-China relationship? Yes, the fact that China’s erstwhile “people’s republic” is a one-party state makes such a reverie seem far-fetched. But that didn’t stop Nixon and Kissinger from acting. And besides: Is there really any other option than to somehow jointly work things out? Not really. And here, a greater sense of equality can only help.